Please contact us via email ([email protected]) or phone Eve on 01726 812815 to reserve your place. 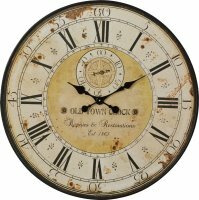 You will be allocated a time on the hour but please arrive 15 minutes before the trip begins otherwise, to ensure full capacity, we may have to allocate the places to customers turning up on the day without bookings and you could lose your place. Back by popular demad PL24 Community Association are organising tours of the the Pinnock Tunnel, on the private Haul Road between Par and Fowey. The trips will be scheduled hourly on the afternoon of Sunday, 7th October from 12pm until 5pm. The Haul Road runs the route of the obsolete Cornwall Mineral Railway from St Blazey to Fowey on which work was begun in May 1872 and which came into service on 1st June 1874. The 1173 yard long Pinnock tunnel on this route is the longest tunnel in Cornwall. It was bored through through a hard sedimentary sequence of slates, siltstones, shales and sandstone known as the Devonian Meadfoot Beds. It was into these rocks that St Austell granite intruded, baking and hardening the sediments and also folding and fracturing them (creating the conditions for the copper mineralisation exploited in the Fowey Consols mine at Lanescott). Although not as hard as granite, the variability of the ground and the presence of many minor faults and shears posed many technical problems for creating a stable tunnel. One of these difficulties was the seepage of water into the tunnel from the surrounding rocks, requiring an efficient drainage system, The tunnel was worked from both ends and from 5 shafts along its course using charges of dynamite set by Cornish miners, there being very little machinery. The removal of spoil was done by itinerant navvies, mainly from Ireland, using wheelbarrows, who slept in tents alongside their place of work, whereas the Cornish miners either lodged locally or sometimes in prefabricated huts. A great many accidents occurred during the construction, three miners being injured boring No. 2 shaft, when one of the charges went off prematurely. After closure in 1968, the trackbed was converted to a road used by lorries loaded with china clay to reach Fowey Docks. Imerys have very kindly given permission for the use of the Haul Road. 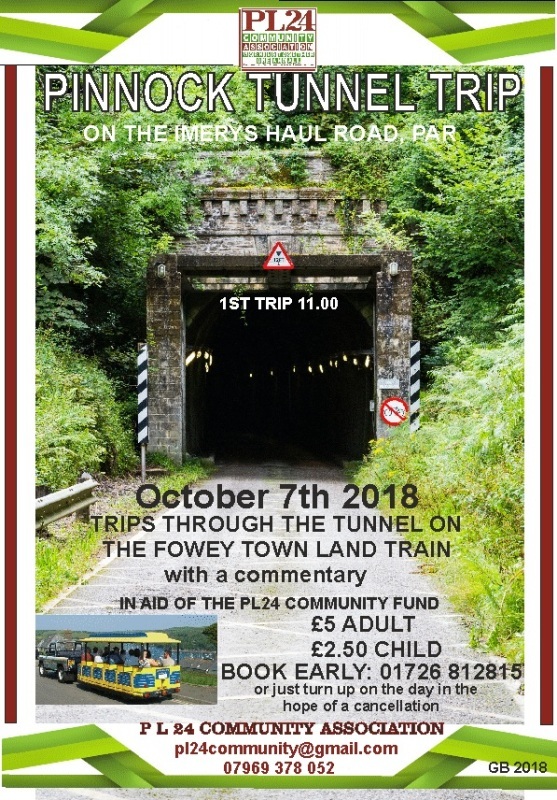 The trips will be in the ‘Fowey Town Train’, a landrover pulling a covered carriage with open sides, and each trip will be limited to 19 passengers. The cost will be £5 per adult and £2.50 for a child (sorry - dogs cannot be carried on the carriage) for the round trip with commentary which takes 45 minutes to complete and payment will be taken on the day of the trip. The previous 4 years trips have proved very popular and booking is essential. 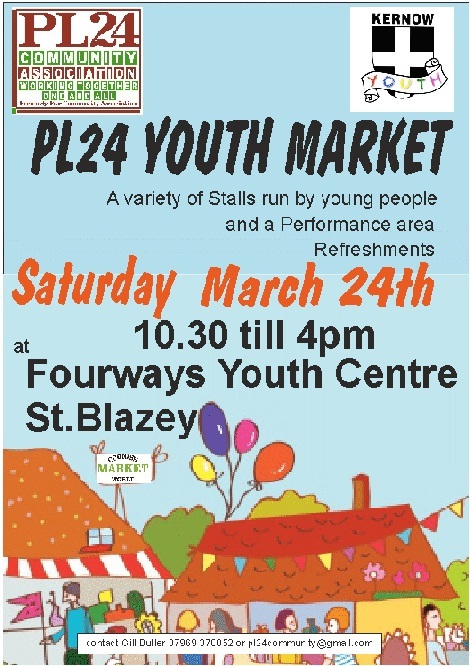 PL24 Community Association will be holding a young people's market at St Blazey on 24th March 2018 at the Kernow Youth Centre (Fourways). The objective of the market is to give young people the chance of running their own Market stall, and getting them involved with community events. This market is the perfect opportunity for us to connect with our large population of young people, by providing a platform for them to be entrepreneurial, try out a new a business idea and sell their products..... crafts, farm/garden produce, cakes, paintings/artwork, photographs, bric-a-brac. This market also gives young people who are already trading online, a chance to trade locally, and hopefully will inspire young people who have never considered the idea of trading before, the chance to have a go. Our Youth Market will also give local young performers a platform to showcase their unique skills and talents and we are encouraging young buskers. There will be a performance area for musicians, dance, gymnasts, circus skills, DJ-ing etc. Young people may also want to run a stall on behalf of an existing business/company, thus giving a bit of advertising support for local businesses. There is not a strict upper age limit but we suggest around 25. Under 16s must have a responsible adult with them. There will be a stall fee of £10 and proceeds will be shared between Fourways Youth Centre Trust, St Blazey, and the Par Bay Wheel Sports Project (skatepark). We have various fund raising side shows/games available, that can be run by young people if they would prefer, rather than having a stall. We are trying something a bit different for our Big Lunch this year. 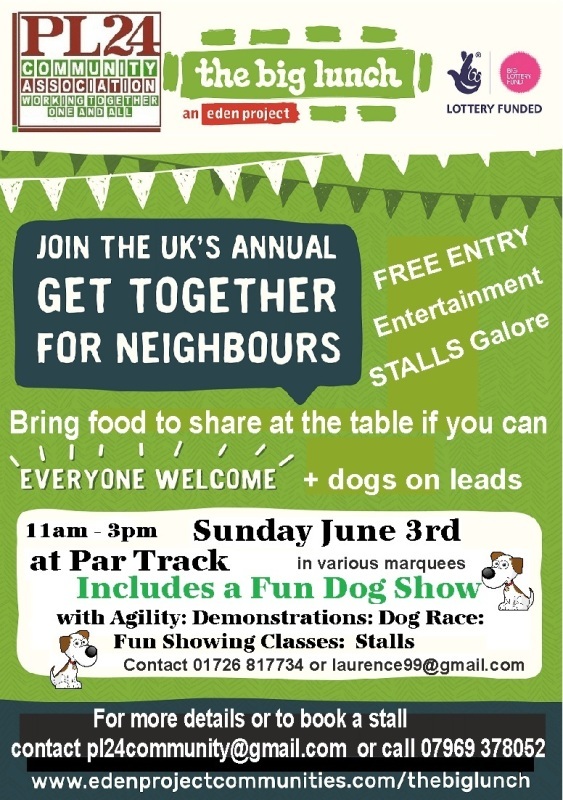 We are combining it with a Fun Dog Show. The whole event will take place in several marquees (since we can't rely on the weather!) on the football field adjacent to the Par Running Track car park. As usual there will be the usual mix of stalls, both charity and business, entertainment, and of course food. The whole idea behind the Big Lunch is for each one of us to bring food to share with the Community if possible. It doesn't have to be a lot. Tables and chairs will be set up in one of the marquees, come along and share food and conversation, and meet new friends. The arrangements for the dog show are being coordinated by volunteers Denise and Laurence Roy. So any for questions relating to the dog show please contact: [email protected] or 01726 817734. 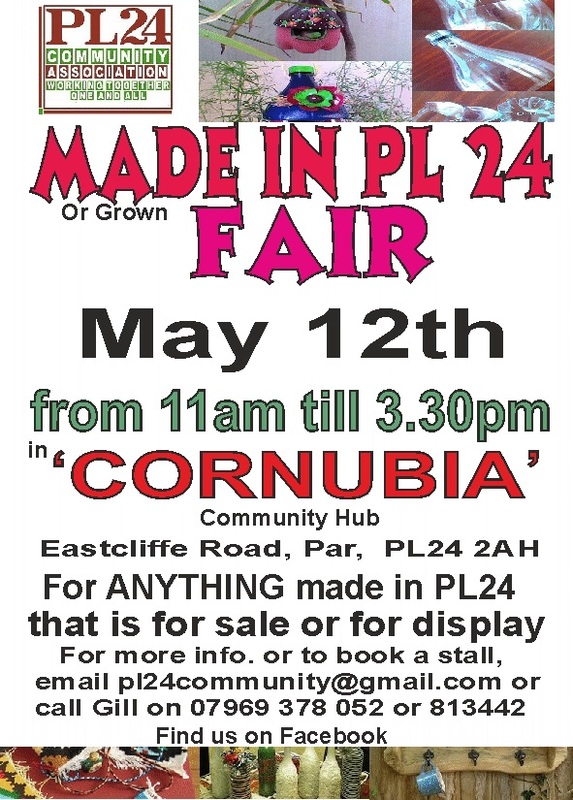 This event is an opportunity for anyone who lives or works in the PL24 postcode area to market and sell their produce. It will take place in Cornubia Community Hub, Eastcliff Road, Par. 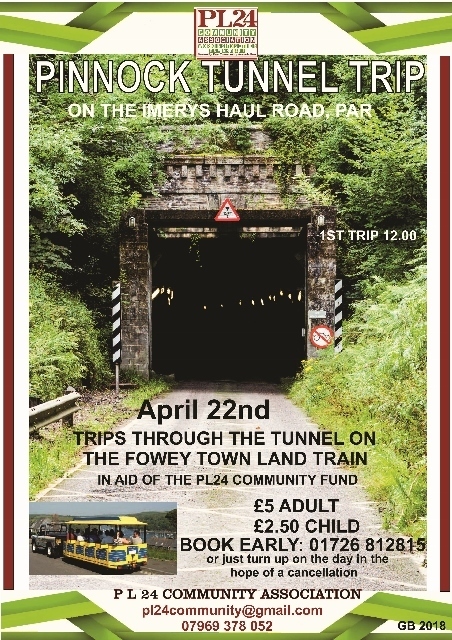 ​​For the 6th year running, the PL24 Community Association (formerly Par Community Association are organising a series of trips through the Pinnock Tunnel, on the private Haul Road between Par and Fowey. This year we have had to switch the event from April to October. The trips will be scheduled hourly on the afternoon of Sunday, 22nd April from 12pm until 5pm. Imerys have very kindly given permission for the use of the Haul Road. The trips will be in the ‘Fowey Town Train’, a landrover pulling a covered carriage with open sides, and each trip will be limited to 19 passengers. The cost will be £5 per adult and £2.50 for a child (sorry - dogs cannot be carried on the carriage) for the round trip with commentary which takes 45 minutes to complete and payment will be taken on the day of the trip. The previous 4 years trips have proved very popular and booking is essential. 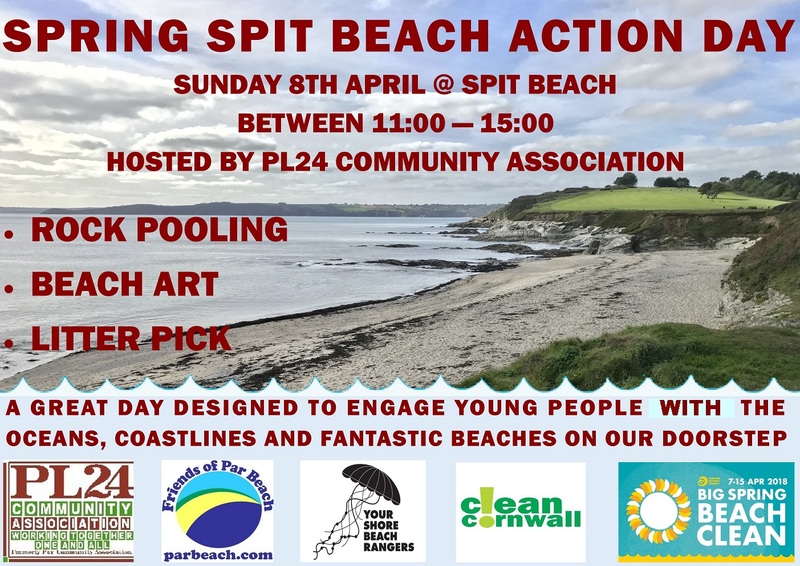 This event will be held beteen 11am and 3pm and will feature a Beach Clean, Fun Rock Pooling led by a professional, Beach art and more. There will be hot drinks available and hot dogs. This event, organised by PL24 Community Association, is in conjunction with Surfers Against, Kernow Youth Centre (Fourways).